a week ago @Bugala requested me informations about some Hollywood libraries I'm working on, he was willing to support my work (thank you Bugala!) and he also asked for something able to handle sliders using layers for his own purposes. So LSlider library was born. LSliders is an include file with no dependancies that uses layers to implement horizontal and vertical sliders with custom graphics, it is particularly useful in games that use the Hollywood's Layer Engine. - Cursor : it is the slider's handle layer that the user can drag with his mouse to change the slider position/value. - BackLayer : it is an additional layer in the back of the other two that is used to apply a color gradient which hilight the area between the beginning of the slider and the cursor position. This is particularly useful with sliders that have a background with transparent areas, this third item is optional. I've built this library creating an object called LSlider, basically it is a table with all possible values defined as default values, it also includes all needed methods to interact with it. There is another table used by this library named LSliders, it holds the item List with all the defined sliders, and it also holds a couple of global functions that will be used to handle the slider's events. When the user creates a new LSlider object with the LSlider:New(args) method the code duplicate the default object (and all its methods) and initialize the arguments specified in the args table. To handle the events I have attached to each slider's layer a button using MakeButton() and the #LAYERBUTTON type, this way moving the layer will automatically move the attached button, and this is particularly useful to manage the cursor's handle. Well, when I detect a left mouse click over the slider's handle I start an interval function that will monitor the mouse position (every 15ms) to check if we need to update the handle's position and the slider's value. This interval function also checks the left mouse button and if it is still down continue to monitor otherwise (if released) clear the interval function that has called itself. Those two does not interfere each other because the slider state changes from "hilighted" to "dragging" and vice-versa. Ok, that's basically how I have implemented the slider object. There are two ways to read the current value, the first one is to attach a callback function at creation time that will be called whenever the slider value changes, this function will receive the slider object as unique argument so the only thing you have to do is to read the mySliderObject.Value field. 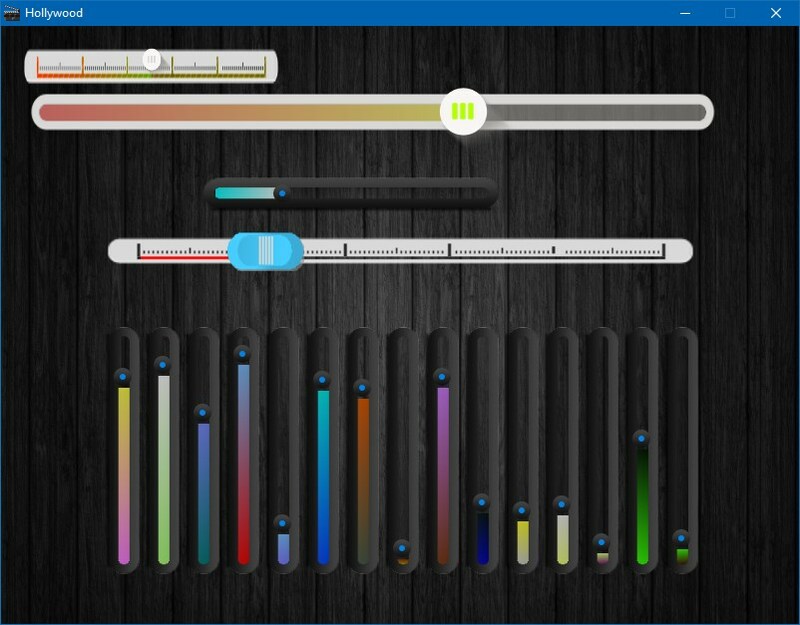 Anywhere you need to show a slider using the Hollywood's Layer Engine. The example is plenty of comments so have a look at it and if something is not clear just ask.